When a user submits a support request through a web form on your Help Center, Answer Bot can immediately suggest links to potentially relevant knowledge base articles. Note: The agent experience with Answer Bot web forms, is identical to that described in Working with Answer Bot (for agents). From this window, the end user can click any of the article titles, or the View full article button, to open the article in a new tab. Clicking the request number to view to their help request in a new tab. Clicking Yes, close my request to close the help request. If the end user clicks this button, they should not expect to receive any more communication about the request. Clicking No to open an optional feedback window, asking for more information about why the article didn't help. If the end user clicks this button, the ticket will be handled as usual. Just as email allows you to continue to manage the triggers that Answer Bot uses to respond with the suggested articles via email, web forms allow you to select and configure each web form experience which will then render the Answer Bot pop up modal on all Help Centers and Brands within your account. Click the Admin icon ( ) in the sidebar, then select Business Rules > Answer Bot. Click the Web form tab. Toggle on Web form channel enabled. This displays an expandable list of your brands and their related webforms. Use the toggles to determine which brands, and web forms, will use Answer Bot. You can use labels (as with email and triggers) to segment and refine the overall articles that Answer Bot uses when searching for the correct articles, for each brand and form. 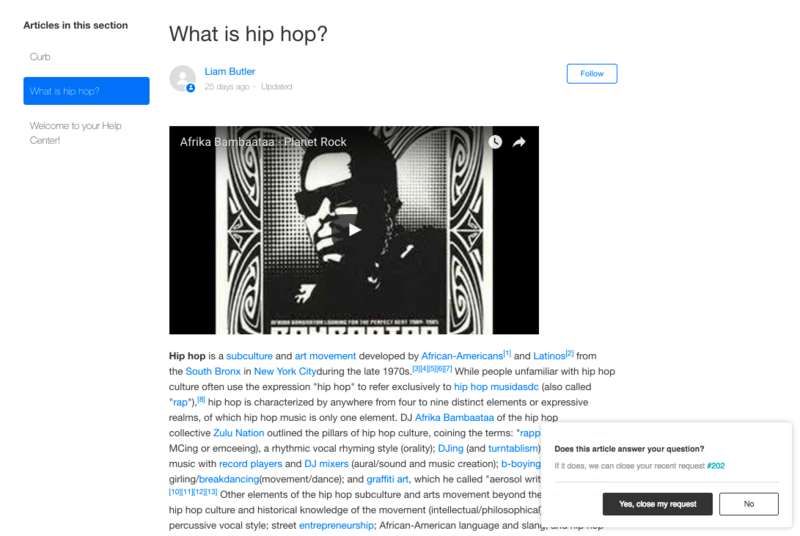 Read about the best practice for using labels with Answer Bot. 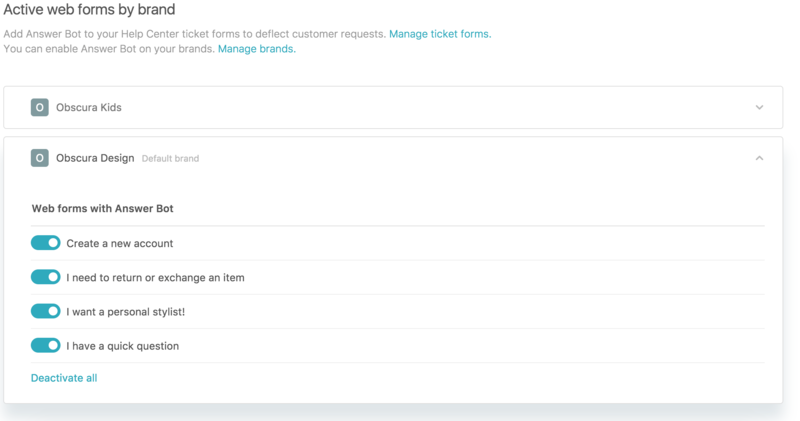 After enabling Answer Bot for a web form, hover over the form name to display the Configure and test link. Click Configure and test to open the testing modal. Enter sample subject and description text to view the possible Answer Bot results for those terms. The pop-up seems to be causing quite a bit of confusion with our customers. 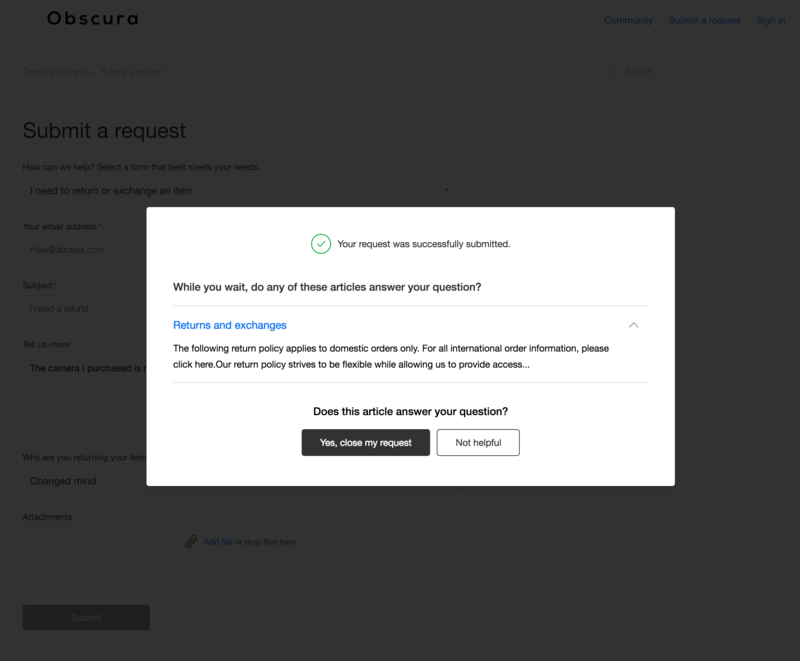 Since we have switched to the webform, over half of our customers who have clicked "Yes, close my request" didn't understand and/or mean to do it. The article they read did not answer their question. They then have to submit a second ticket and we get a bad customer satisfaction rating because we didn't answer their question before closing the ticket. I realize that "Yes, close my request" might seem obvious that if you click it you are saying that the article helped you and to close the request, but given the data I am seeing it's not. If I had to guess I would say folks just see the black button and think it's closing the pop-up and not their ticket. Are you seeing others with this problem? I wanted to turn this pop-up off and have answerbot provide answers in the trigger we set up to reply to the requester when the ticket is created, but this doesn't seem to work, answerbot doesn't provide any suggested articles. +1 I'm wondering the same thing as Shannon. We're noticing a lot of people are possibly closing their request via web form unintentionally, then they follow up and ask why we never responded. Is there any way to customize the copy on the pop-up/overlay? I have the exact same problem as Shannon as well. It would be really great if we could customize the text on the screen and buttons as we refer to requests as "Tickets" and are not connecting the dots. They are using the button thinking it is close the window. Maybe simply changing the button with "Not Helpful" to "No, close window", would help suffice as well. It is a huge problem for us and we may even decide to stop using Answer Bot because of this. It would be nice if we could key off of this event in triggers and send them a message like; "It looks like you have set your ticket to solved by choosing a relevant article. We are glad you were able to find a resolution. However, if closing the ticket was not your goal, please reply to this email and let us know. We will be happy to help"
Now I know that people who have proven that they do not read will probably not read, but this will give a path back and some CYA. I agree with the others above - this is a simple change but it has a big impact, the call to action button to mark the ticket as solved is far too strong. We've had a few cases where customers have closed their ticket thinking they were just closing the window, then have followed up to query why we didn't respond. A simple change to CSS styling on those buttons is all that's needed. I created a product feedback post here regarding this exact thing. We're running into the same issue where our customers are closing the ticket without meaning to. Go upvote/follow and hopefully we can get some traction with Zendesk on it. The interface of Answer Bot on web forms has recently changed and because of that I decided to give it a try again. (after switching it of because users were not understanding the interface) Unfortunately I found that users are still not understanding what they need to do and in order to close the window. They are still indicating that their request was solved instead of clicking the X on the top right or even 'No, I need help'. Over the past 3 weeks we had to re-open about 50% of the Answer Bot resolved tickets. Also our satisfaction rating has dropped due to users not understanding why their ticket was solved all of a sudden. This cannot be the intention of Answer Bot. It needs to be fool proof and intuitive. Manually going through each Answer Bot resolution and reopening them, is also creating more overhead then it is saving. Is there anything else being done on the design, or better yet, can we fully manipulate the design in the future? If it stays like this I'm afraid this feature will not work for us and we will switch it off again. Maybe something else that could help. It would be nice if we could send them a message when they "solve" their ticket trough Answer Bot without viewing any articles, telling them it was THEM who solved the ticket and not the agent. Right now this is not possible because you cannot indicate in the trigger if it was an answer bot solve or not.